Even if gastronomic symphony of Mediterranean tastes doesn't need presentations, we spoke with our famous chefs and discovered some more secrets that transform local dishes in excellent gastronomic treats. 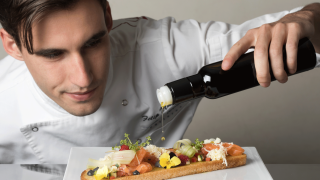 Aleš, magician of Mediterranean tastes, is in love with his job: this is the first thing you notice when visiting the chef at the Grand Bernardin 5*. Head chef at Kempinski Palace hotel Portorož. Mladen Knez is from Strunjan and he has loved good local food since childhood. An excellent young cook who wants to present his guests a completely different, new way of enjoying food and drinks. Famous chefs make local dishes become a culinary excellency.